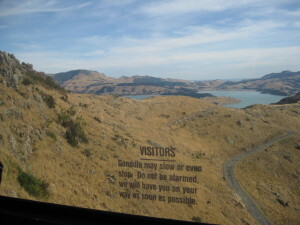 There are several routes through the rugged Port Hills; zigzag up the Bridle Path tramped into the tussock by the early settlers; cut straight through the centre via the Lyttleton tunnel; zoom around hairpin bends on the spectacular summit road; or like us, take the Gondola and swing straight up a sheer cliff face in a glass bubble on slim wire cable. Accustomed to leaping virtual tall buildings, if not mountains on their Nintendo DS and their PSP, the kids laugh madly as a rocky hillside hurtles towards us, but we adults clutch each other’s sweaty hands in panic while, beyond a sign which tells us not to be alarmed if our capsule stops, the flat ground drops swiftly away. As we dock at the summit a couple of school teachers lead a troupe of miniature mountaineers, all in high-visibility gear, over the skyline. We are indeed in the land that nurtured the Sir Edmund Hillary. We picnic on a vertiginous slope. In front are the modest towers of Christchurch and beyond them, the Canterbury Plains stretch away to the Southern Alps. On one side the Pacific Ocean vanishes into the horizon. On another there are folds of dun coloured hills, Lake Ellesmere and a roll of surf on the Tasman Sea. Behind us Lyttleton Harbour lies like an opal in its volcanic crater bed. Impervious to the view but not the dizzying height and space the kids dance madly on the edge of the land and make wild leaps at the sky. As we lurch off one side of the summit for the return trip in our glass bubble, the tiny hikers set off through the tussock on the other. We watch the line fluoro yellow hats until they vanish behind a ridge. Just in front of us a red sail drops from a cliff. We follow it as it circles the fading evening sky. “Can we do that tomorrow?” ask the kids.